Why go on a day trip when you can go on a gay trip? 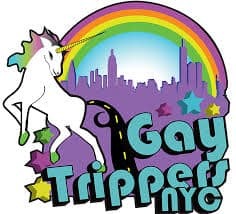 Gay Trippers NYC is a New York-based gay bus tour company. All of the trips depart from the supremely gay Hells Kitchen on 45th Street and 10th Avenue. Check out their website to see what tours they have planned. From gay cooking classes to gay ski weekends, you’ll find an alternative to the bars and circuit parties, meet new people and see new places. They can also plan private tours and help to organise parties.